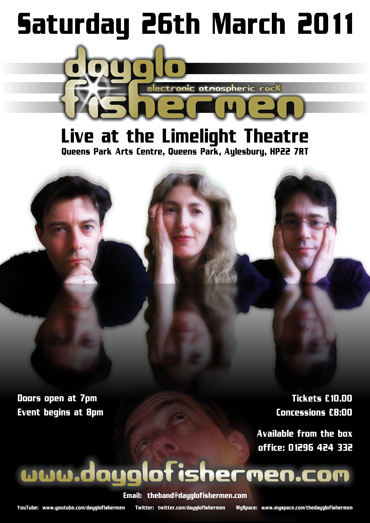 Dayglo Fishermen are pleased to announce that they will be performing a one-off concert next year on 26th March at the Limelight Theatre, Aylesbury, UK as a celebration of the release of their most recent album, Moons That Cast Their Light. As well as showcasing many songs from the new album, the band will be performing some of their classic tracks. As with their previous concert at the same venue in 2008, this is sure to be a thrilling and mesmerising experience for all who attend. For information and tickets contact the theatre directly on 01296 424 332.